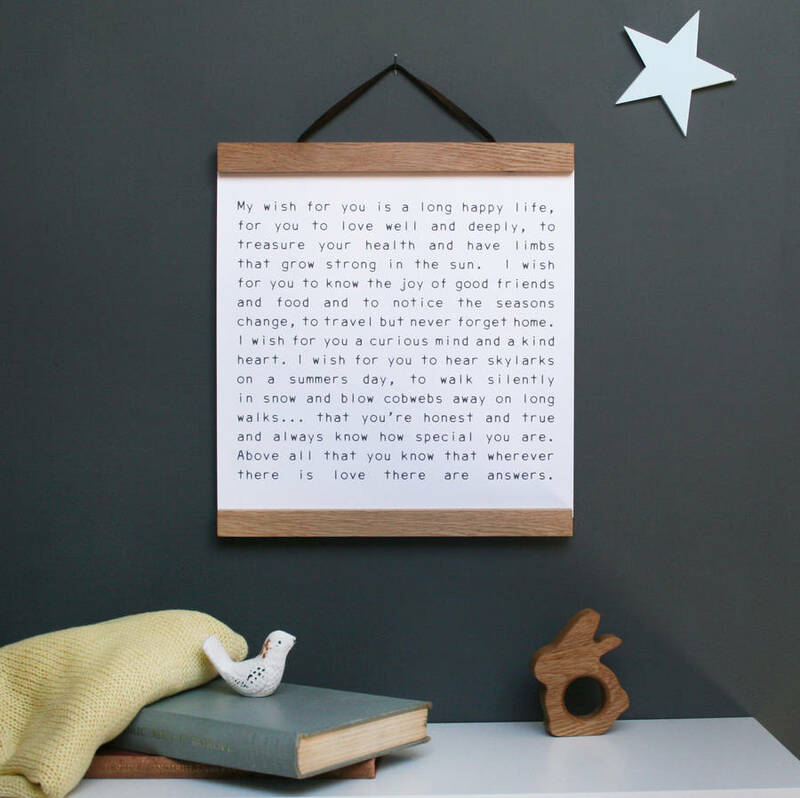 A thoughtful and stylish print in a personalised oak hanger for a new baby or Christening present. 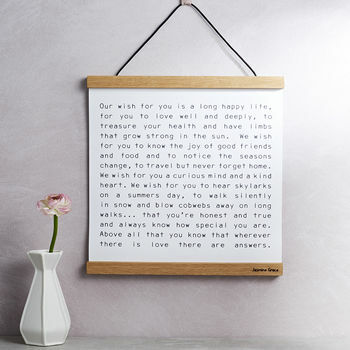 A heartfelt message captured in print to be treasured forever. This print is designed using either 'My WIsh' or 'Our Wish' depending on who it's from and will provide a lasting reminder to the recipient of how loved and special they are. A lovely gift and keepsake, perfect for a newborn, Christening, Naming Day or wedding. The solid oak hangers make a lovely alternative to the traditional frame. The hangers can be engraved with a message of your choice - please see the examples. These prints are a wonderful gift from godparents, grandparents or parents alike. 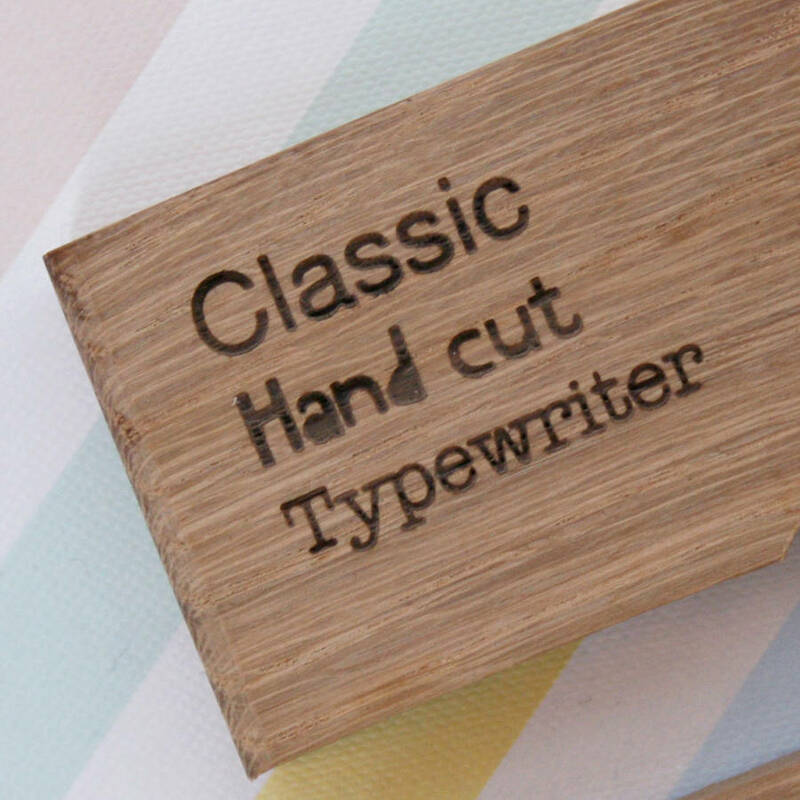 Engraving available in 3 fonts - handcut, classic OR typewriter. Your print is printed on a lovely, matt, acid- free heavyweight paper, 280g. It is smooth white, cotton-based, British-made and museum quality. Framed in solid oak hangers, ready to hang. All poems are copyright MODO CREATIVE LTD.
My wish for you is a long happy life, for you to love well and deeply, to treasure your health and have limbs that grow strong in the sun. I wish for you to know the joy of good friends and food and to notice the seasons change, to travel but never forget home. I wish for you a curious mind and a kind heart. I wish for you to hear skylarks on a summer's day, to walk silently in snow and blow cobwebs away on long walks,.. that you’re honest and true and always know how special you are. Above all that you know that wherever there is love there are answers.